The Monument is the prominent rocky peak at the head of the Purau Valley. It is easily seen from the Port Hills. It gives a great day's climbing for a middle -grade climber. Some really high-quality routes in the 17-20 range are here, plus a pleasant setting and reasonable access. Generally the climbs follow well-developed finger/hand-size crack systems, and are free from loose rock and vegetation. The climbing style is varied, and the harder climbs tend to be the better quality ones. The cliff is sheltered from the NE winds, and dries out quickly after rain. Access is through Diamond Harbour and along the Purau/Port Levy Road. Park at the pass at the top. Walk along a track to a low rocky saddle, then go up throug h paddocks to the northeast end of the cliff. As this cliff is in a popular walking area, it is not necessary to ask the farmer's permission to climb. 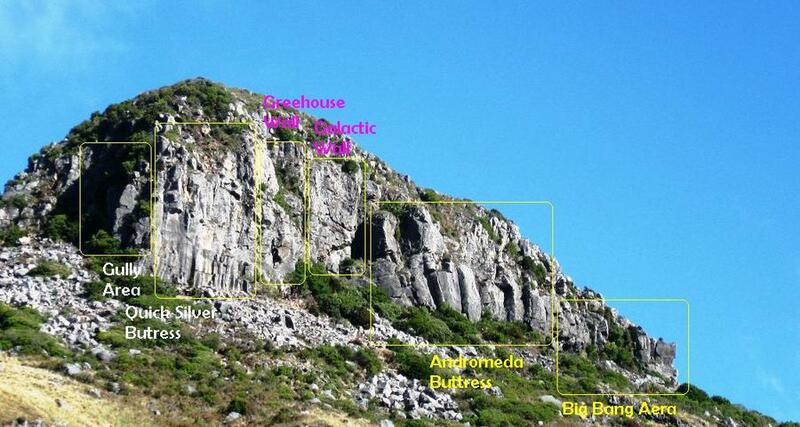 Observations from a quick climb on sat re quake damage: Quicksilver Buttress has had significant rockfall. It is still climbable, but has numerous loose blocks above and would be unsafe with further quakes. Andromeda Buttress is of sound rock, quality climbing and worth a visit.